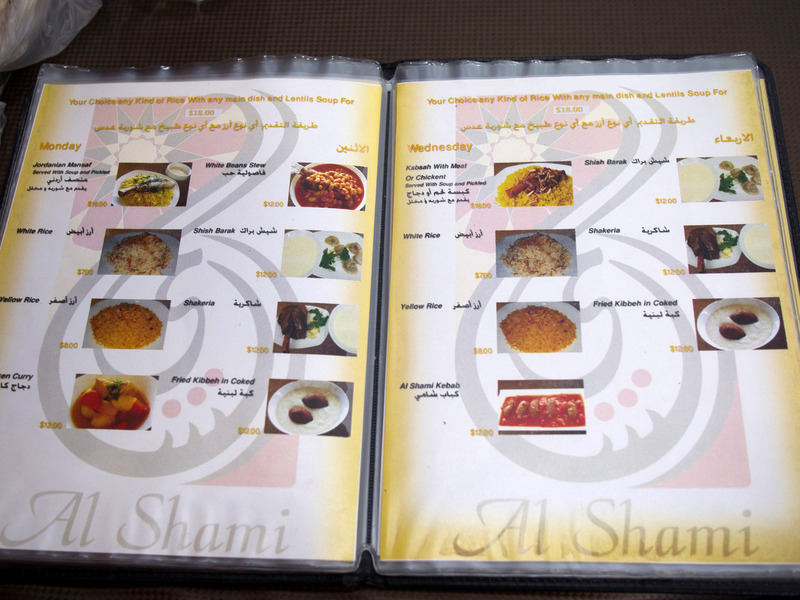 A lunchtime feast at Al Shami in Merrylands, where the daily special is a drawcard that can't be beat. 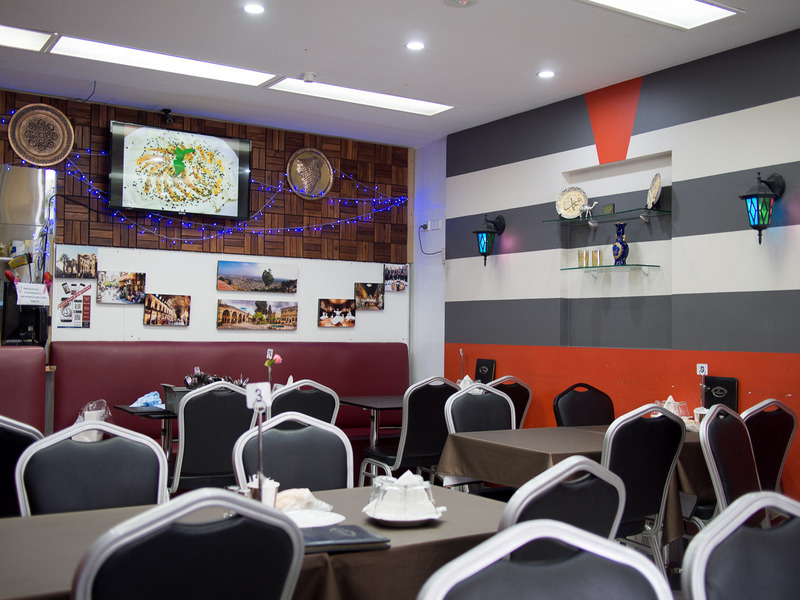 Merrylands is the food suburb that just keeps on giving. We dream of the lamb choppan at Kebab Al-Hojat, the monto at Walli Asr and the fresh wholemeal Afghani bread from Golden Wheat bakery. 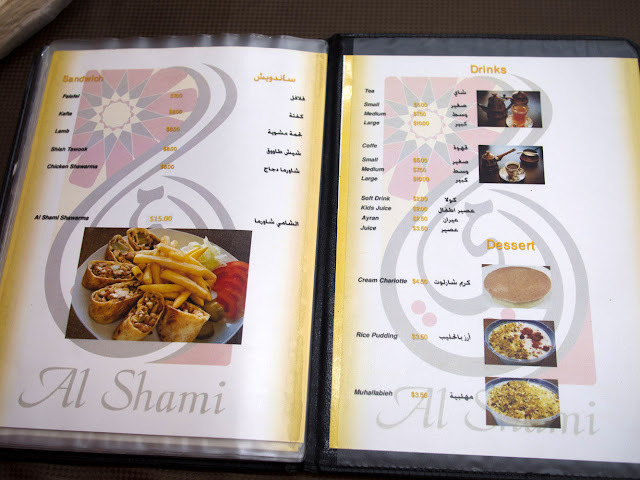 Recently we've added another favourite to the list with Al Shami, a Lebanese and Syrian restaurant with a cracker of a specials menu. Al Shami has a decor straight out of the B-Kyu dream book, bright and clean with no fuss or bother. 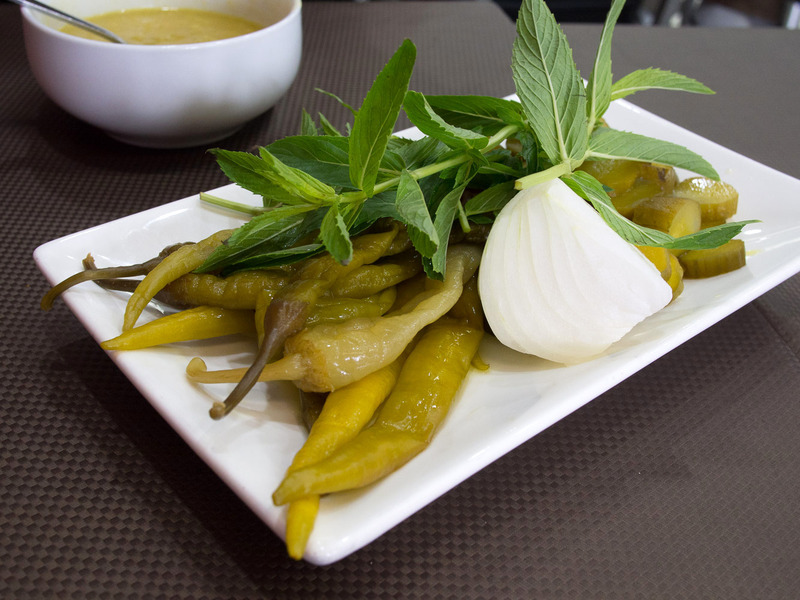 The meal starts as it often does in most Levantine style restos with a plate of pickles, fresh mint and raw onion in wedges placed on the table. The long pickled peppers don't have a heavy chilli hit, but watch the squirt of pickle juice as you bite in. You are intended to munch on these throughout your meal, taking small bites of the onion as you eat and eating the fresh herbs with the flat bread (already waiting for you on the table in small plastic bags) and other food served. There's a special menu every day except Tuesday, when they are closed. For $18 you get a lentil soup, a main and rice. On Monday and Wednesday there's an even better deal at $15. 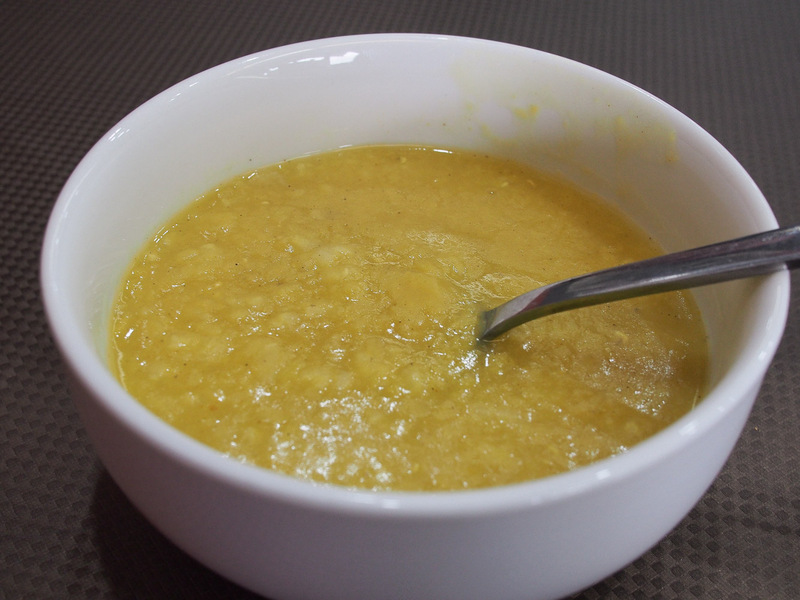 The small bowl of lentil soup really acts as a stomach opener and it had better be ready for what is to come. 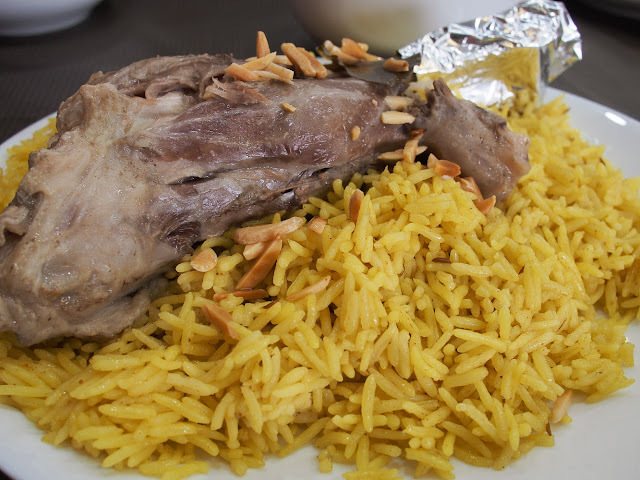 We are at Al Shami on a Thursday, where one of the specials is Jordanian Mansaf, a whole slow braised lamb shank on a bed of yellow rice sprinkled with toasted slivered almonds. 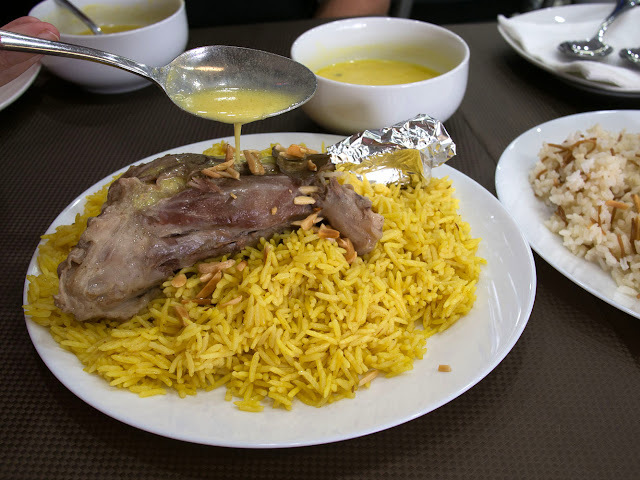 Served with the lamb is a bowl of melted butter sauce, poured over at the table as you wish. This makes the dish creamy and luscious. 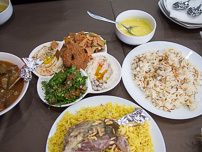 To break up the meat feast we add on a mixed vegetable plate with hummous, a smokey and deep flavoured baba ganoush, the crunchy bread salad fattoush and a sparkling green tabbouli. 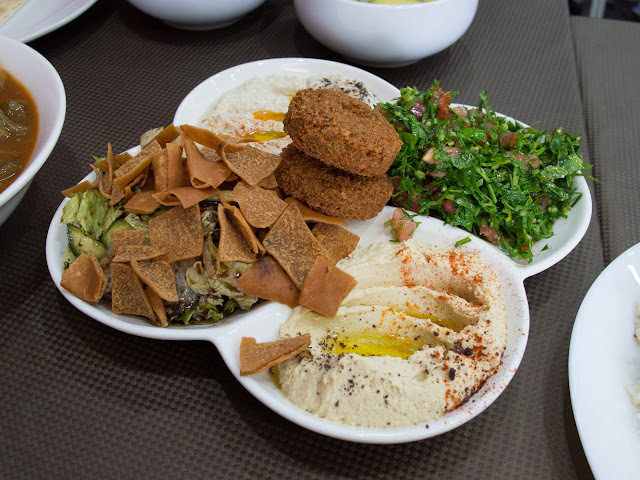 Teetering on top are two crisp falafel, shaped like small donuts. The other special we pick is Okra Stew, thinking it would be a lighter veggie dish. But we are thwarted but highly delighted with the discovery of a huge lamb bone sticking out of the bowl and hunks of soft stewed lamb inside the dish. 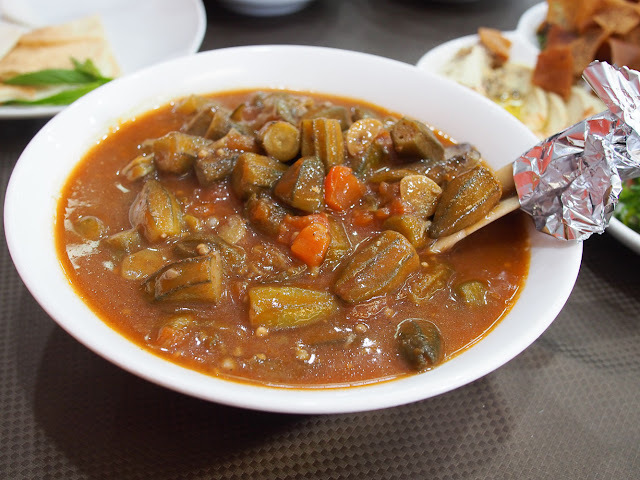 The flavour of the okra stew has less of the pickled lime taste you might find in Persian food, more hearty tomato stew. 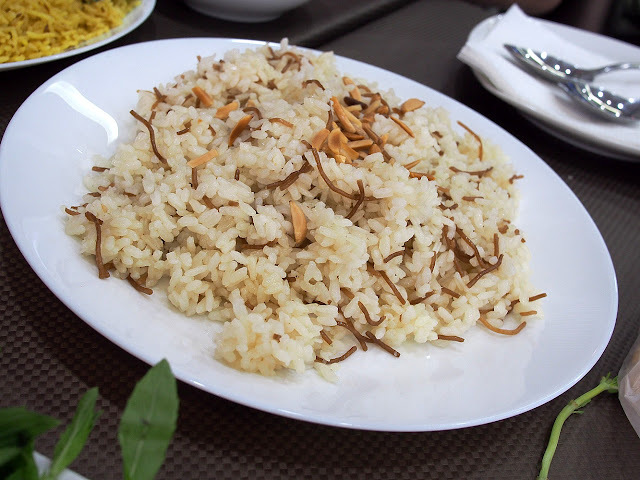 The rice that is served with the okra is steamed, but generously sprinkled with almonds and a brown vermicelli noodle. We're thankful we didn't get more rice with the mansaf, it was offered but we declined. We took home two boxes of leftovers, the meal was so generous and satisfying. Breakfast is served from 9.00am. 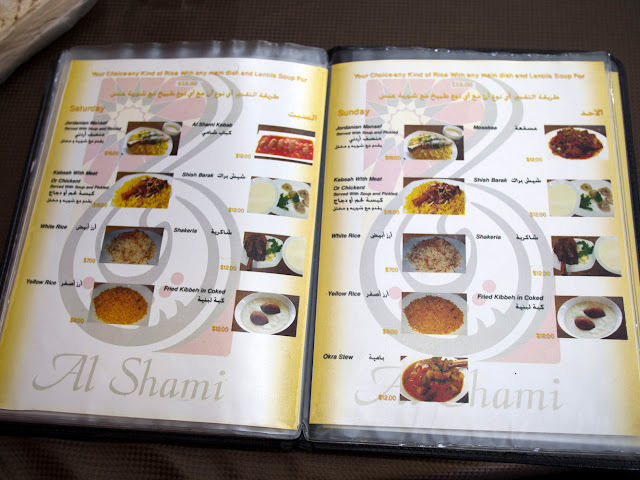 The regular menu, compete with Family Meal options. 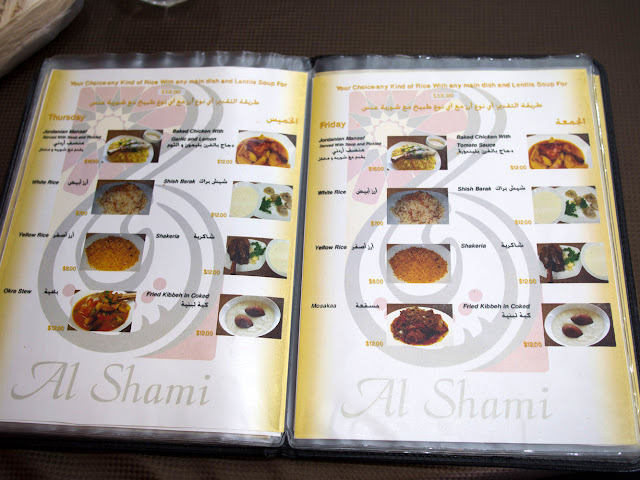 Al Shami Restaurant is at 240 Merrylands Road, Merrylands. Phone 8677 1671. Friendface. 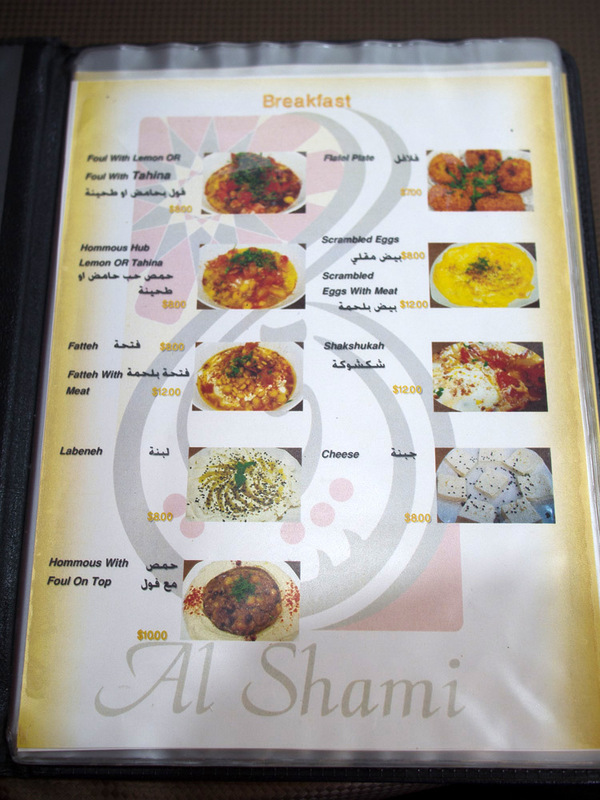 Al-Shami is great, and the breakfasts were excellent, especially the foul which was stodgily authentic (in a good way!). Sadly though, we were there for lunch yesterday and it seems they have stopped breakfast and seem to be opening only at 12. 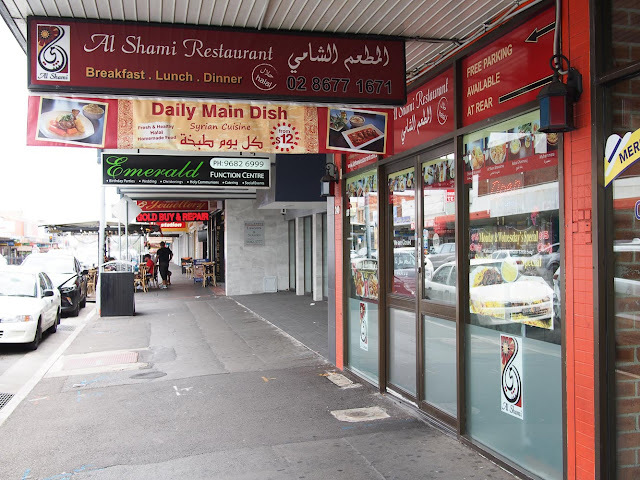 I could be mistaken , but it felt like there were new people behind the counter so maybe it has recently been taken over, or maybe breakfast trade was slow? Interesting, we were there only a few weeks ago and it seemed all systems go. A good reason to get back out there. Perhaps the service on a public holiday was a little different? Nah, wasn't just a public holiday thing sadly. 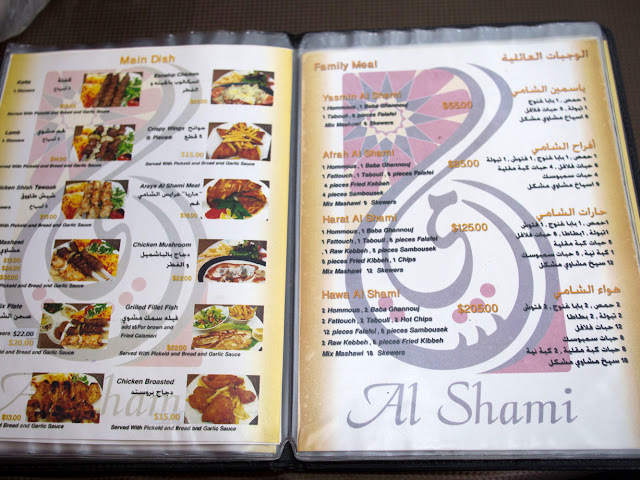 They had signs up all over the restaurant saying that they were only opening at midday in future. 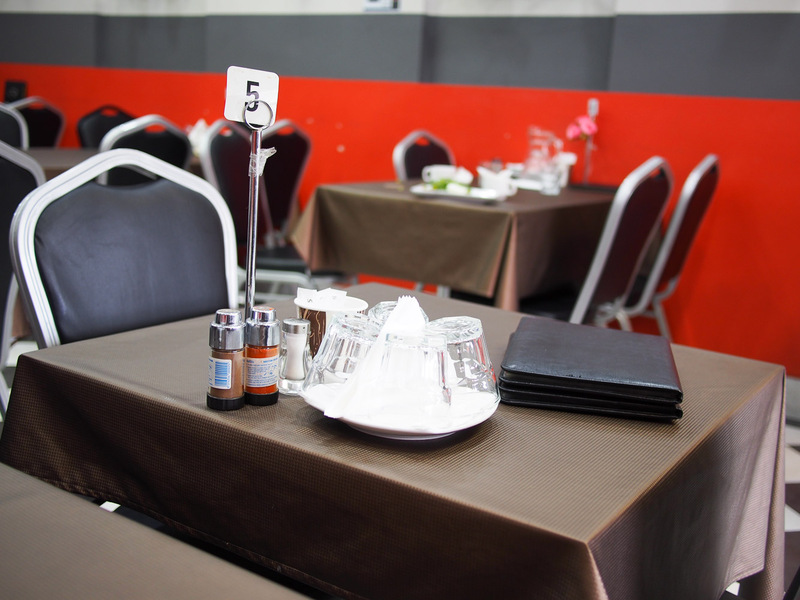 Didn't look like the breakfast menu was out of bounds though, so maybe you can still get your foul for lunch? Sounds like a revisit is in order. Thanks for the update.